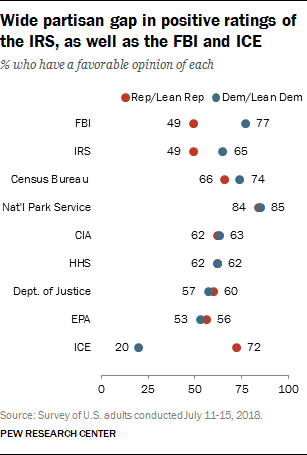 A new survey of public attitudes toward federal agencies finds that partisan differences in views of the FBI have increased markedly over the past year. And Americans’ opinions about Immigration and Customs Enforcement are deeply polarized: 72% of Republicans view ICE favorably, while an identical share of Democrats view it unfavorably. 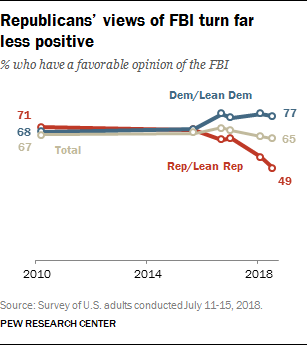 Democrats’ views of the FBI have changed little over this period: 77% of Democrats and Democratic leaners view the agency favorably, compared with 76% early last year. However, views of ICE are evenly divided. About as many Americans view Immigration and Customs Enforcement favorably (44%) as unfavorably (47%). Today, 57% of Democrats and Democratic leaners view the Justice Department favorably, while 36% have an unfavorable opinion. The share of Democrats with favorable views of the department have fallen 17 percentage points since January of last year (from 74% to 57%). Republicans’ views of the Justice Department have become more favorable since then; 60% view the department favorably, up from 47% about a year and a half ago. 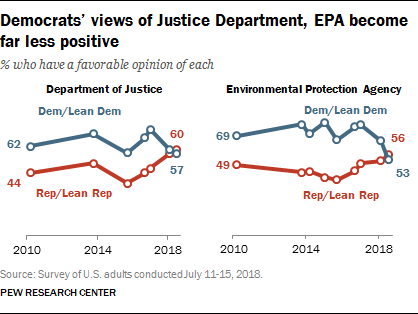 Similar shares of Republicans and Democrats now view the Justice Department and EPA favorably – the first time that has occurred in surveys dating to 2010.